These wonderful Fall whale conditions just keep on rolling along. Hardly a breath of wind, glassy surface, blue water and blue skies with warm sun. 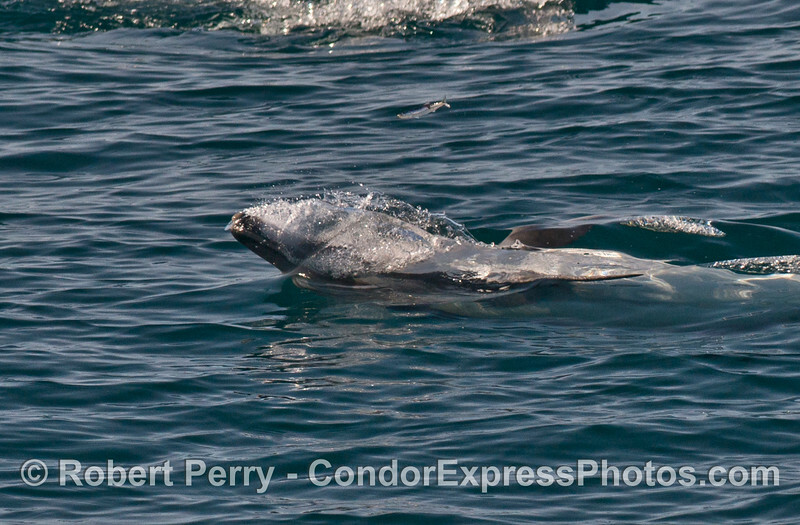 Right out of the harbor we encountered about 8 inshore bottlenose dolphins and ran with them through the East Beach anchorage. 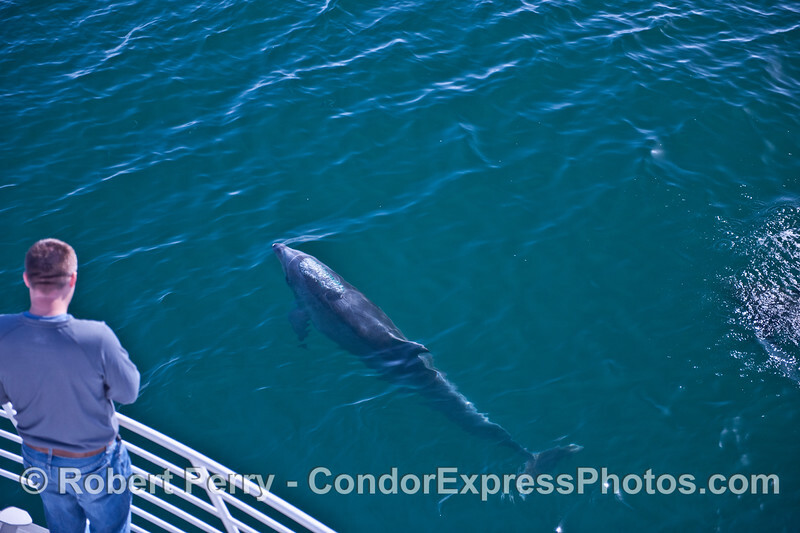 One of the large bottlenose was being kept company by a California sea lion and the two "porpoised" alongside the Condor Express for quite a while together. 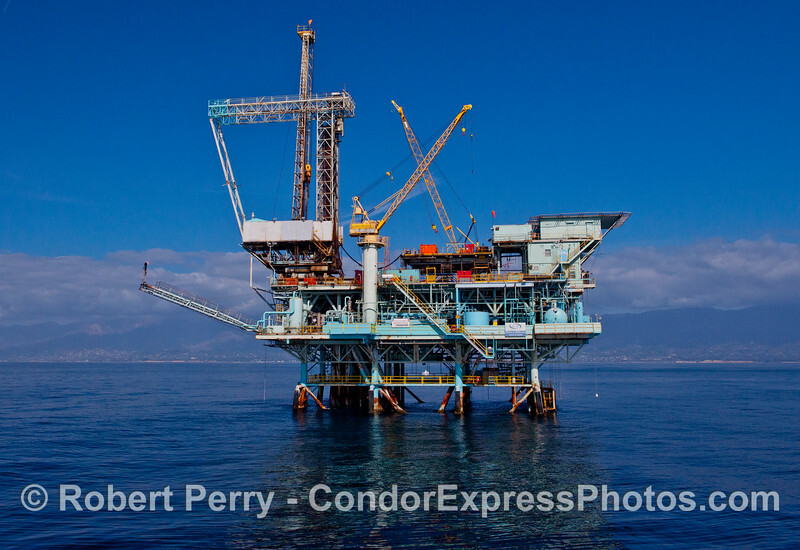 Just south of the oil rigs we came into a hot spot full of birds, dolphins an a few Minke whales. It was a spectacular sight. Moving a mile or so to the southeast from this hot spot we had our first humpback whale of the day. 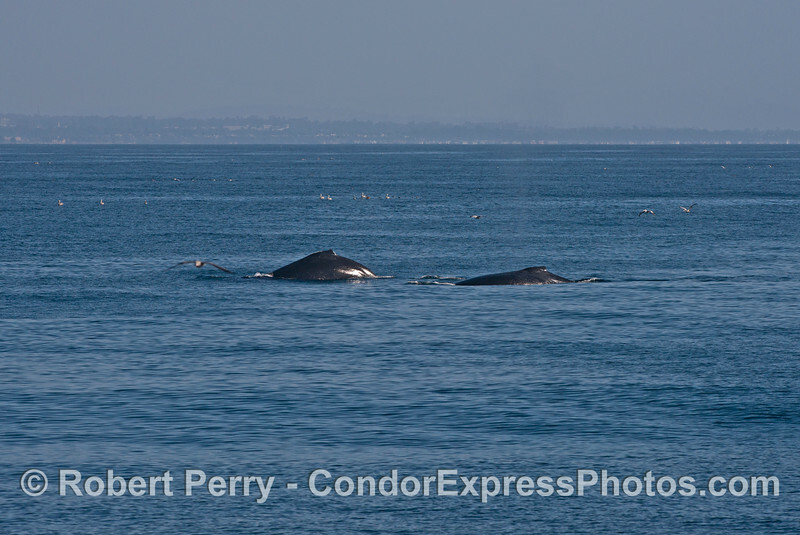 It was a single whale that kept moving ahead on a straight path with nice surface times and good tail flukes throughout. The keen eyes and binocular skills of the crew soon had more activity in sight, a few more miles to the east. Here we came upon a massive hot spot full of more seabirds, dolphins and Minke whales. 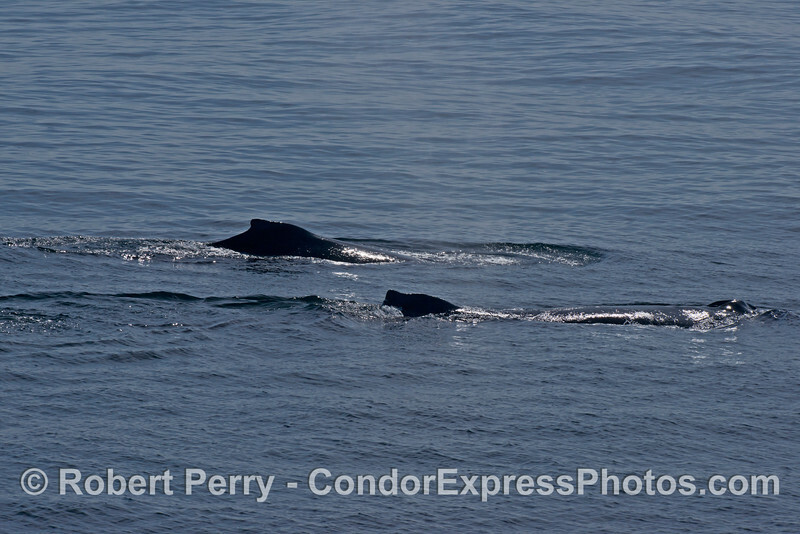 Two more humpback whales came in to enjoy the banquet. 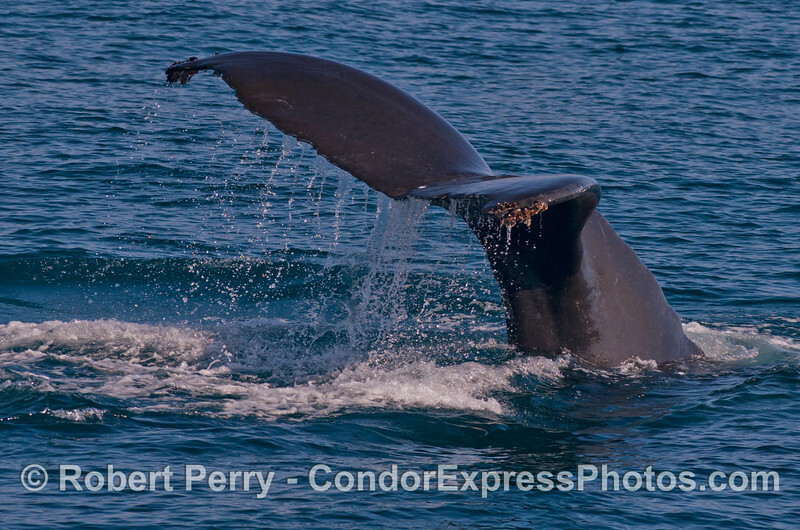 When all things were done and we were heading home, the total counts were somewhere in the neighborhood of 8 bottlenose dolphins, 3 humpback whales, 6 or 8 Minke whales, and about 800 common dolphins. Wow. What a fantastic Sunday in the Fall. You can see where we went by clicking on the "Map This" button. 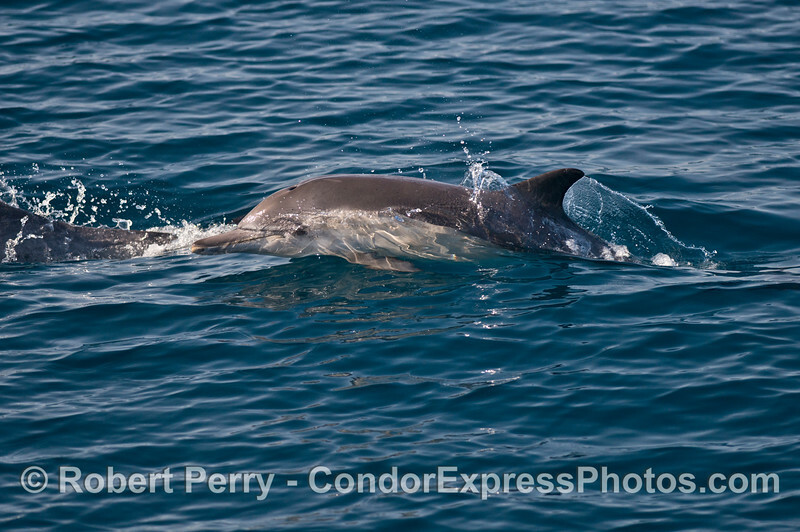 A smiling common dolphin (Delphinus capensis). 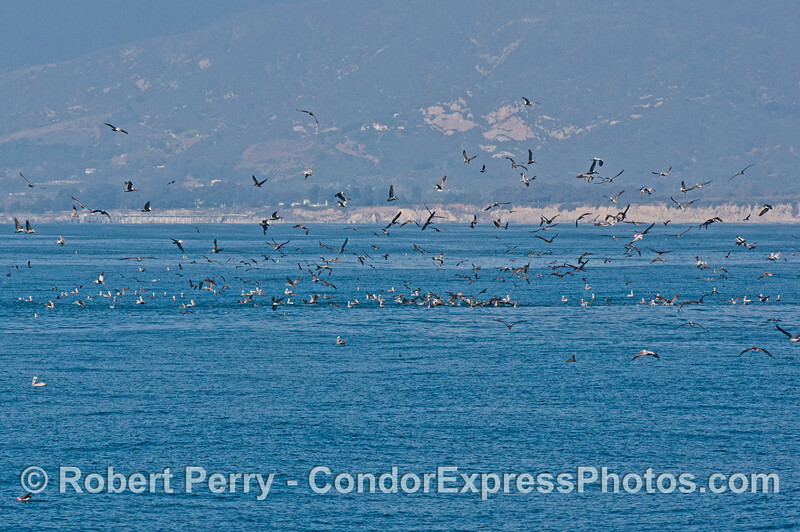 A hot spot full of feeding dolphins and seabirds. A northern anchovy (Engraulis mordax) flies through the air as it escapes the lunge of a common dolphin (Delphinus capensis). 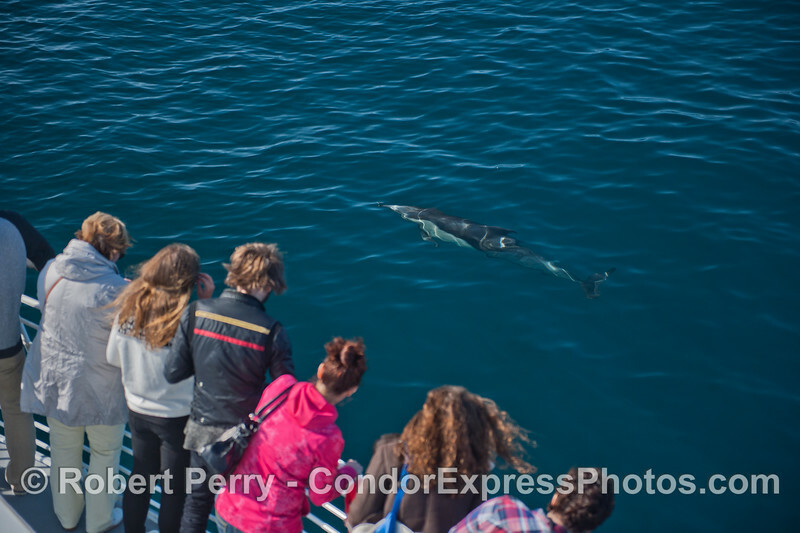 A common dolphin (Delphinus capensis) comes over to greet the people. 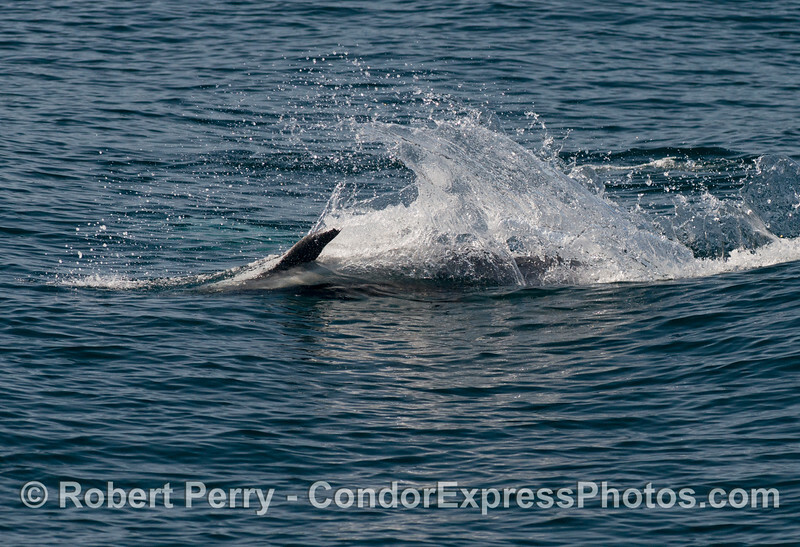 A sideways feeding attack by a common dolphin (Delphinus capensis). 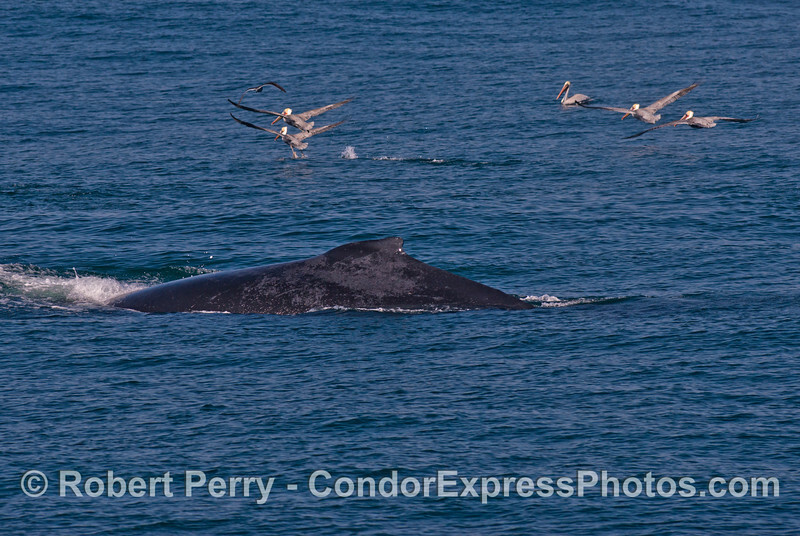 A humpback whale (Megaptera novaeangliae) scares off a group of brown pelicans. A close look at the twin exhaust pipes of a humpback whale (Megaptera novaeangliae). Humpback whale (Megaptera novaeangliae) tail flukes. 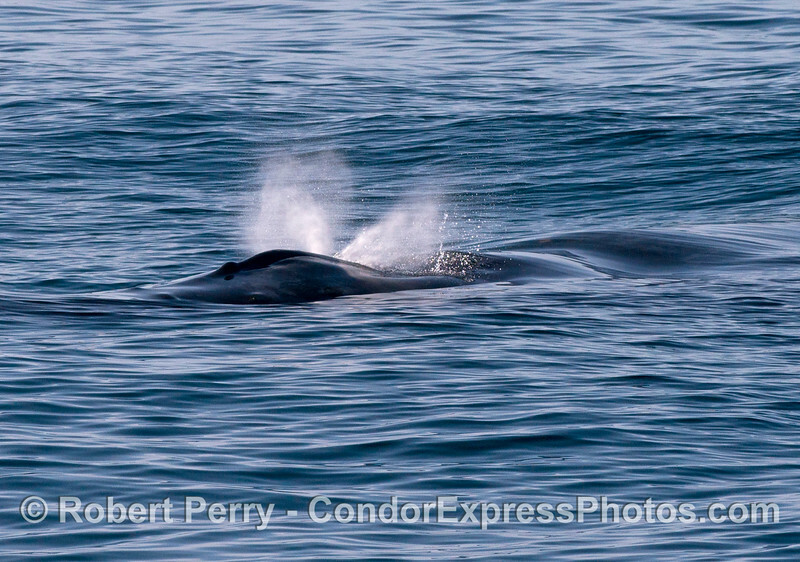 Two humpback whales (Megaptera novaeangliae). 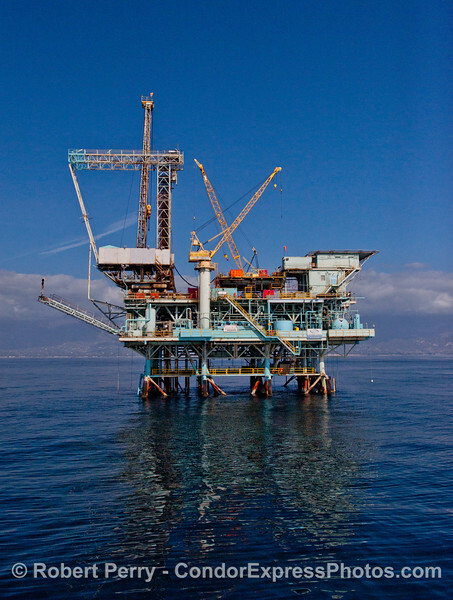 Offshore oil and gas platform Hillhouse. 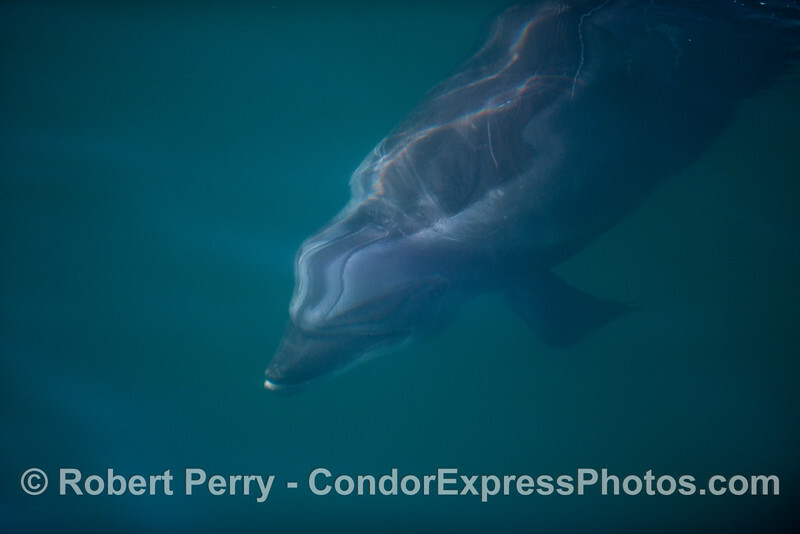 An underwater look at a diving bottlenose dolphin (Tursiops truncatus). 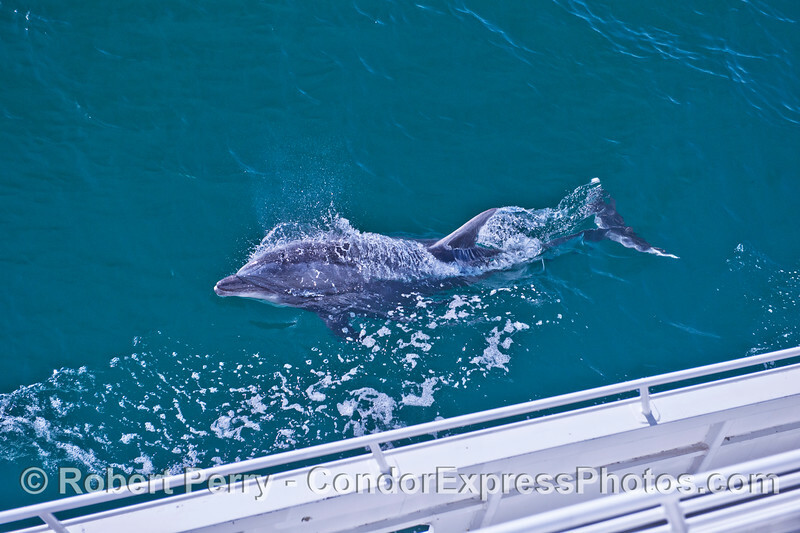 A large bottlenose dolphin (Tursiops truncatus) rides alongside the Condor Express. 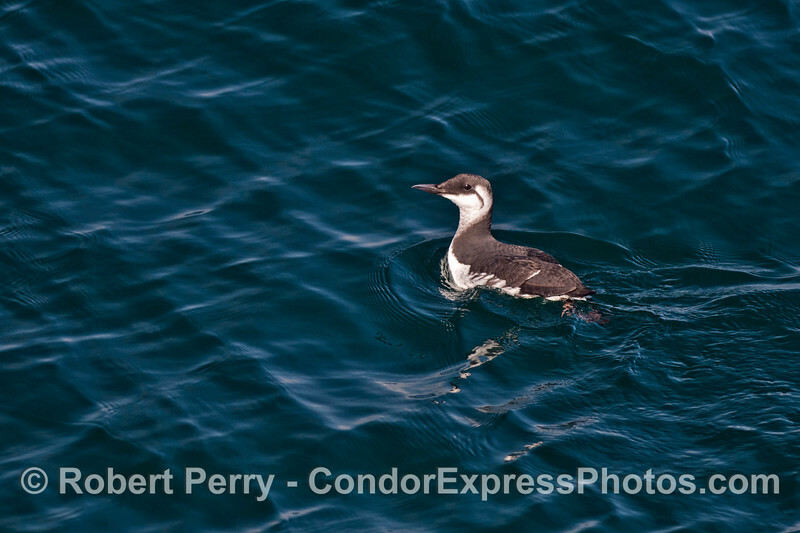 A common murre (Uria aalge). A friendly bottlenose dolphin (Tursiops truncatus).